Parents looking for a city to keep their kids happy while on vacation should take a close look at all the wondrous things to enjoy in Santa Barbara. Hotels along Cabrillo Boulevard are walking distance to some of the most interesting and entertaining venues desiged with children in mind. Everything in Santa Barbara is only a few minutes by car or uber, and in a flash families can visit places to build a lifetime of memories. Below are some special places children will adore while vacationing with thir parents or grandparents. A favorire place of kids big and small the Santa Barbara Zoo, located a short walk or drive (good parking at the zoo) from Cabrillo Boulevard, where you will find all the wonderful animals you hope to see on any trip to the zoo. The Masai giraffe’s, lions, gorillas, elephants are all a delight. Guests can observe the preparation of food for the 500+ animals at the Zoo from a large window overlooking the Ridley-Tree Animal Kitchen. Cost: free with Zoo admission. There are two outdoor restaurant venues for people lunches as well. Take your camera to get shots of spectacular views while riding the train through the property, and shopping for souvenirs in the gift shop is always fun. For hours and admission information visit: https://www.sbzoo.org/visit/. The Santa Barbara Natural History Museum Sea Center located on Stearns Wharf is another amazing experience for traveling families. The Sea Center is owned and operated by the Santa Barbara Museum of Natural History. It offers numerous marine exhibits and aquaria with a window on the Santa Barbara Channel. Children and adults enjoy assistance from the helpful staff who provide wonderful interactive opportunities for visitors to experience little sea creatures up close and personal, along with entertaining hands-on learning displays. The gift shop is filled with unique sea inspired keepsakes to take home. For hours of operation and tickets visit: http://www.sbnature.org/sc/224.html. 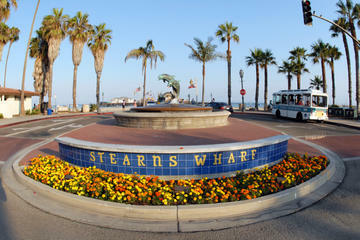 The Stearns Wharf is a historical site that offers valet parking, a bevy of wonderful seafood restaurants, the Deep Sea Winery, a charming candy store and more. See Stearns Wharf details at visit: www.stearnswharf.org. I know that this is one of the most beautiful places in the world, and hope you enjoy visiting Santa Barbara this summer. For additional travel information please visit: http://SantaBarbaraCA.com.